Maybe it sounds stupid, but can someone check my profile out and say what's wrong? I've submitted 7 proposals last 10 days and haven't got hired, every job I've applied to is "closed" now. I'm not getting even interviewed. I think I have bad english in my cover letters or overview. Probably, I should add more projects to my portfolio? Can you suggest me something, please? I'm just here since three months and therefore, I know how it can be difficult to find a first job. 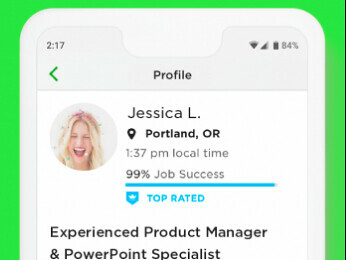 You have a "rising talent" badge which is a good thing. It's gonna help. You seem to have a good profile and I'm pretty sure that it's gonna be fine for you. Anyway, I'd like to give you just one advise: Perseverance is the key. Very inspiring! Thank you so much. Go do some research on how to write really great proposals. 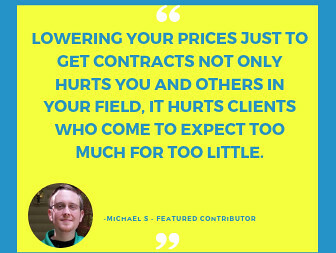 Figure out if your hourly rate is competitive. It seems really low to me, but I don't know your field. 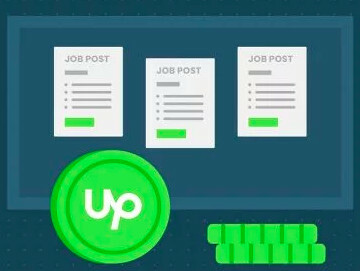 Look up successful profiles here on Upwork, in your area, and see how you compare. Don't copy, but make sure you have a profile that is competitive. Fill out your skills at the bottom some more. Apply to things with fixed rates that you know you can do. Do a search for the number of freelancers with your skills to see how many you are competing against. Don't apply for contracts that have been sitting for more than a day or two. Look to see how long it's been since the client has looked at the job and how many freelancers have applied. My rule of thumb is no more than 5 freelancers have sent proposals and no more than 10 have been invited to apply. Beyond that clients are looking or thinking my skills are comodity. They are not. Apply carefully to only things that you think you have skills for that make you stand out (like you've done a similar job). Send an example if you have one or can make one up quickly. Ask one relevant question in your proposal that assures the client that you've thought through the project and have the skills to make the work successful. Ten days is nothing here on Upwork. It takes a lot of people months to find their first job. Great advices, Michelle, thanks a lot!